Seven candidates, all identifying as people of color and/or LGBTQIA, are making their bid for Minneapolis City Council. 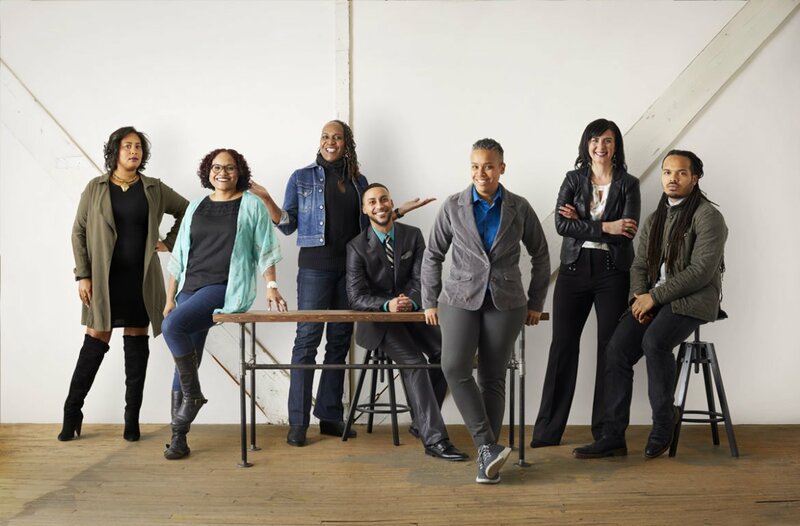 From left: Raeisha Williams, Samantha Pree-Stinson, Andrea Jenkins, Phillipe Cunningham, Erica Mauter, Jillia Pessenda and Jeremiah Ellison. Photo by Anna Rajdl. On some of the coldest days of the season, we asked seven Minneapolis City Council candidates to stand in an unheated studio after long work days and stuck a massive camera lens in their faces. “Wear something that shows off your personality, that you feel confident in,” we told them. Some had life partners or campaign staff in tow, some on their own. They each walked in with apprehensive smiles that warmed to grins as Biggie, Beyoncé or the Backstreet Boys popped on the music playlist. We were all jittery with the cold, with meeting new people, with the vulnerability of getting a photo taken. But when asked what made them take the leap to run, any remaining nerves transformed into resolve. One by one they opened their eyes and spoke long held truths that became seeds for stump speeches: because representation matters, because racial equity, because of my community. We focused on these seven candidates – Jillia Pessenda, Samantha Pree-Stinson, Phillipe Cunningham, Raeisha Williams, Jeremiah Ellison, Andrea Jenkins and Erica Mauter – because they bring in terms of race, gender identity and sexual orientation, an unprecedented level of diversity to the 2017 elections. Not only do they embody a new potential for Minneapolis politics to be more reflective of its growing populations than ever before, but with platforms heavily focused on social justice, racial and economic equity, they bring a potential to shift the balance of power on the City Council. From February through March, you will see seven in-depth profiles on each of these candidates in the weeks running up to the April 4 DFL party precinct caucuses as part of a series we are calling “A Seat at the Table.” We encourage you to read them, share them, digest them and learn what a new kind of representation would mean for Minneapolis. From community organizing for the Occupy movement like Pessenda, serving as communications chair for the Minneapolis NAACP like Williams, or developing a new My Brother’s Keeper chapter for Black youth like Cunningham, these candidates have roots in the movements that have shaped 21st century political discourse and a wide range of professional expertise. Pree-Stinson, running for Ward 3’s open seat, is a mother of three, a veteran and currently works for Medtronic. Mauter from Ward 11 trained professionally as an engineer before becoming a nonprofit arts executive. These candidates have worked on successful campaign trails, they have experience crafting policy, with youth development and strategic planning. All seven of them have backgrounds in the arts and want to see creative solutions intrinsically built into the culture of the city. “These are not people who woke up on a Tuesday and said, ‘Oh, maybe I’ll run for City Council.’ These are people actively engaged in resistance. I’ve been doing this for years, and I’m not going to stop any time soon,” Jenkins said. Jenkins has worked as a policy aide for City Council Vice President Elizabeth Glidden’s office for 10 years. An unapologetic Black, trans activist and renowned poet, Jenkins is running for Glidden’s empty seat in Ward 8. “Even if none of us get elected, this drive is not going away. You’d be underestimating the power of movements,” Jenkins said. Artist-organizer and candidate for Ward 5 Ellison looked at the cadre of candidates with shared values, similar backgrounds and identities and was reminded of a quote from astrophysicist Neil deGrasse Tyson. “What profession do all these senators and congressmen have? Law, law, law, businessman, law… Where are the scientists? Where are the engineers? Where’s the rest of life?” Tyson said in a 2011 interview. For seven candidates who identify as people of color and/or LGBTQIA to show up all at once in the city elections is no coincidence. These candidates represent growing nationwide efforts that have been building for years. At the national level, even after sweeping Republican wins, the 115th Congress is the most diverse in the history, with more people of color and non-Christians serving at the federal level than ever before. People who identify from historically marginalized communities are taking back their narratives and their representation in government in ways we haven’t seen before. On the 13-member City Council, 12 of the members are DFL, with Council Member Cam Gordon the sole Green Party member. Despite the group’s homogenous party affiliation, the reality is anything but. A slim majority has long dug its heels in, preventing policies to move quickly despite massive public support. When looking back at the voting records of the City Council, a pattern emerges. Whether it’s preserving funding for the city’s Green Zone’s Policy, advocating for employee voices to advise on paid sick and safe time legislation, calling for more robust translation services and countless other initiatives, a group centered around Council Members Gordon, Alondra Cano and Andrew Johnson, with frequent support from Council Vice President Glidden and Council Member Lisa Bender stands up time and again to reduce racial disparities and increase equity. If a greater number of council members committed to social justice were added to the City Council’s progressive core what could that mean for how policy is crafted in the city? “When we have diversity of experience, that brings about diversity of thought. Our work then becomes more inclusive in nature, which means progress,” Pree-Stinson said. Each of the candidates is focused on the needs of their wards, but that doesn’t mean they have to be siloed. Many candidates pointed out that a key to breaking council gridlock is starting from a place of mutual respect. “Let’s build quorums. If something doesn’t affect you negatively, but could be really impactful in my ward, let’s work together. My goal is to find those common denominators. We’re all failing each other if North Minneapolis isn’t doing well,” Williams, a local businesswoman and community advocate also running in Ward 5, said. “We would be starting from a place of shared values. Not just the nuts and bolts everyday running of the city, but really thinking forward. If you can act on those shared values, we would already be ahead,” Pessenda said. While there is early energy and support around these campaigns, the path to the council dais is by no means an easy one. Of the seven candidates featured in this piece, five are up against incumbents – and all the resources and establishment support incumbency often brings. During the 2013 elections, current incumbent Council Members Kevin Reich (Ward 1), Blong Yang (Ward 5) John Quincy (Ward 11) and Council President Barb Johnson (Ward 4) all won their seats by margins in the double-digits. In Ward 4, where Cunningham is making his bid, Johnson or her family members have held the seat for more than 50 years. And although Minnesota is known for its high voter turnout, city elections (held in odd years) are an outlier to the trend. 2013’s City Council elections saw turnouts below 50 percent across all 13 wards, including some as low as 23 percent turnout. Many candidates expressed how their neighbors have felt cut out and disenfranchised, particularly in parts of the city that formed as a result of redlining and segregation. To combat low turnout in favor of more meaningful engagement, candidates are planning multi-pronged approaches to engage more voters. Doorknocking, robust social media presence, attending and hosting community events. But engagement is more than just reaching out. “How we build consensus – between council members and in the community – is just as important as what the solution is,” Mauter said. The first major hurdle is April 4, when the DFL holds party precinct caucuses citywide. All seven candidates featured here are seeking DFL endorsement. The endorsement carries serious heft in a liberal stronghold like Minneapolis. In both the 2009 and 2013 city elections, all candidates that won the DFL endorsement for their ward also won the election. You can find more information about the caucus, who is running and when ward conventions will be held at the Minneapolis DFL website. You gave us a great perspective on the candidates! Thank you! I also love the picture and the idea you had for how they should appear in the picture! It really DOES show their personalities! This story made me so happy to live in Minnesota! Thank you for this. I will be sharing the good news and mobilizing voters around these candidates. Ellison and Jenkins will be the only winners. Turnout depends much on the top race, the election for mayor. With several real candidates, I hope we will see a strong turnout this year. For years, 3405 Chicago Ave was a radical community hub. The building housed three interconnected pillars of South Minneapolis: the Minnesota Transgender Health Coalition, RARE Productions and Cafe SouthSide. In the 2017 election, the Minneapolis government experienced the largest shakeup in local government in recent history. Along with new mayor, Jacob Frey, the city council received five new members as well.